Much of the company’s later history can be seen as an ongoing attempt to fulfill that vision. In the late 90s, Wright built a nationwide distribution network incorporating best practices in automation and operational discipline from his former employer. In the early 2000s, Amazon scrapped his model in favor of software-powered fulfillment centers that enabled a continuous, predictable flow of goods through each facility and provided customers with definite delivery windows for their purchases. Even since Stone’s book was published in 2012, the company has grabbed headlines with forays into delivery drones, air freight, and even floating warehouses. Time and again, Amazon has demonstrated an astonishing ability to mold its entire distribution model to service any segment, customer, or market that it chooses. Last Friday’s announcement is just another chapter in that story. Amazon realizes that groceries are a must-win if Prime is to reach its full potential. At 7% of consumer spending, groceries represent by far the largest share of retail expenditure. Amazon wants shopping through Prime to be reflexive; consumers shouldn’t even have to think about alternatives. To truly ingrain Prime in this way, the company needs to be competitive in groceries. The challenge once again is in the distribution network. 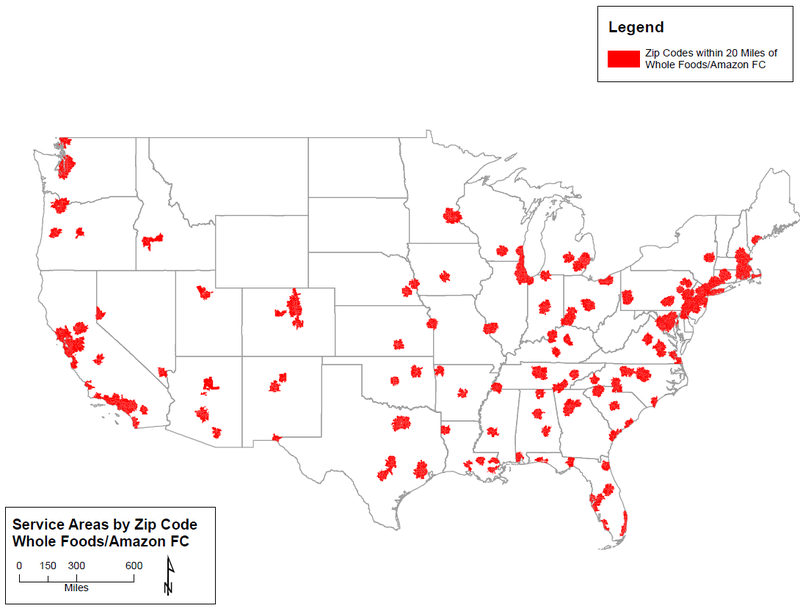 Above is an approximation of the locations of Amazon’s Fulfillment Centers (“FCs”). This is a network optimized for efficient transportation — hence, the proximity of FCs to airports. It has worked wonders in all sorts of categories, from books to consumer electronics to apparel, using a simple formula: Amazon optimizes the network for endless selection, hypercompetitive pricing, and guaranteed delivery windows, and then sits back and collects market share. The company also offers it as a service to third party sellers through Fulfilled by Amazon, which doubled in unit volume last year. However, as the company learned through AmazonFresh, this is not a winning network for groceries. As this brilliant article points out, groceries are unlike other retail categories. They are first and foremost local markets. With books, Amazon can build up supply and then wait for demand trickle in. It’s not ideal, but the inventory isn’t going anywhere in the meantime. But unlike books, food is perishable. Grocery inventory often needs to turnover within days or it’s useless. Understocking is just as damaging as overstocking as it risks costing the entire basket when customers start looking for individual items elsewhere. This chicken-and-egg dilemma makes groceries look more similar to ride-hailing than other categories in retail: Amazon needs to scale both supply and demand simultaneously. More importantly, it needs to do so in every city that it operates in, independently. That is a very hard problem. How does Amazon build a grocery distribution network with local density? Perhaps unsurprisingly, these do not represent major population centers. Amazon aptly balances real estate costs and access to customers by selecting FC locations within a few hours of major metro areas. It is worth noting that some analysts posit that expanding the definition of a “fulfillment node” beyond FCs to include product sorting centers, delivery stations, and Prime Now Hubs results in significantly expanded population coverage assumptions. That said, not all of these are full-scale operations. Regardless, Amazon is still way behind competitors like Walmart in terms of proximity to major population centers. 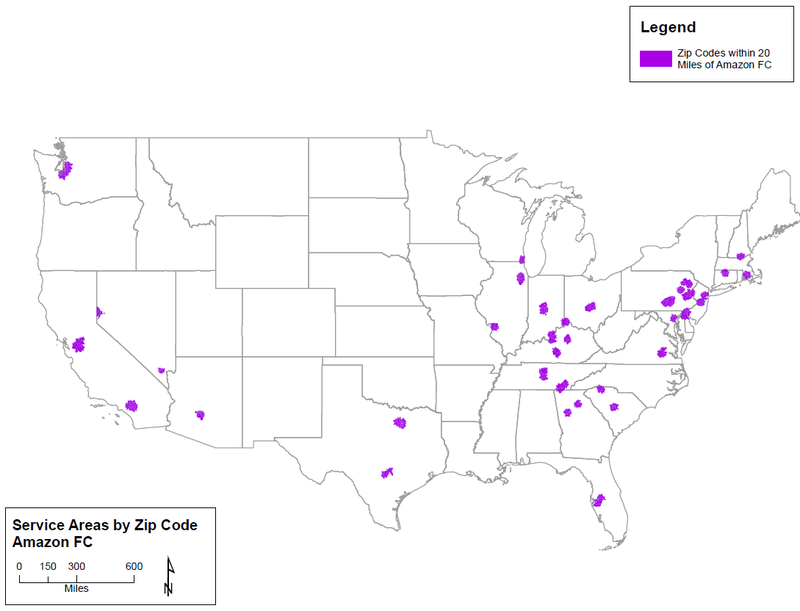 Here are the ZIP codes within 20 mile buffers of Amazon when we include Whole Foods stores. 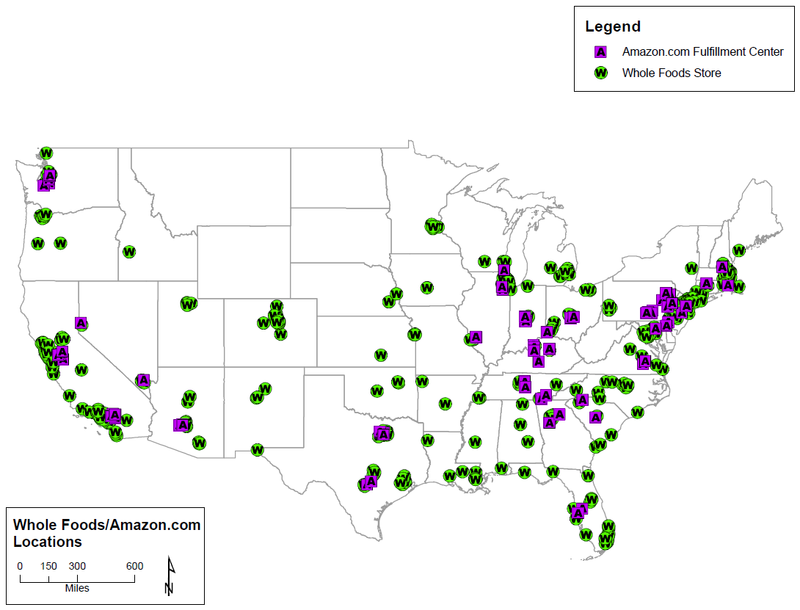 The total population within a 20 mile radius of an Amazon-owned location now reaches 191 million people. That puts Amazon in the same neighborhood as nearly 60% of Americans. The figure illustrates one of Whole Foods’ famous core competencies: site selection. In the company’s most recent 10K, Whole Foods lays out this methodology: “In selecting store locations, we use an internally developed model to analyze potential sites based on various criteria such as education levels, population density and income levels within certain drive times.” Not only is Whole Foods within a short drive of 55% of the U.S. population, ZIP codes within the buffers report an average per capita income of nearly $35,000, over 25% higher than the national average from the most recent census. Whole Foods has invested heavily in understanding who its customers are, determining where they live, and building stores to service them. Incidentally, these are exactly the urban, educated, wealthy customers that Amazon wants shopping on Prime. A more subtle point is that, especially for these higher-end customers, shopping for food is often less transactional and more experiential. Even though they will use Prime to save time when making mundane CPG purchases like toilet paper, they will still go out of their way to go shopping at Whole Foods, or Trader Joe’s, or, better yet, their local farmer’s market. This is arguably the direction most brick-and-mortar retail is heading and Whole Foods is well-positioned to lead the way (more on this to come). But what about supply? The average Whole Foods store carries over 34,000 SKUs from over 1,400 local farms as well an array of regional and national producers. More importantly, it stores the bulk of this inventory in places like SoMa and the Upper West Side. It would be very hard for Amazon justify the cost of building a standalone FC in places like these. But if that warehouse also happens to be a profitable store with weekly sales per square foot of $915, the numbers start making sense. Amazon now owns all of the ingredients for a winning distribution model in groceries. So what will they do with their new purchase? This is where the argument turns speculative. That is, if the deal even goes through. A good place to start is to observe the complimentary investments in distribution that the two companies have made. Amazon has spent decades developing the most efficient and sophisticated logistics network of its kind, but, until now, hasn’t shown much interest in operating stores. Meanwhile, Whole Foods has focused on building a differentiated in-store experience to service prime retail locations, arguably at the expense of distribution. In fact, like several of its peers, Whole Foods has woefully underinvested in its logistics infrastructure. The map above shows Whole Foods’ distribution network. Again from the company’s 10K, we know that Whole Foods’ distribution assets consist of exactly three seafood processing facilities, three regional commissary kitchens, four bakehouses, and 11 regional distribution centers (“DCs”). That is thin. 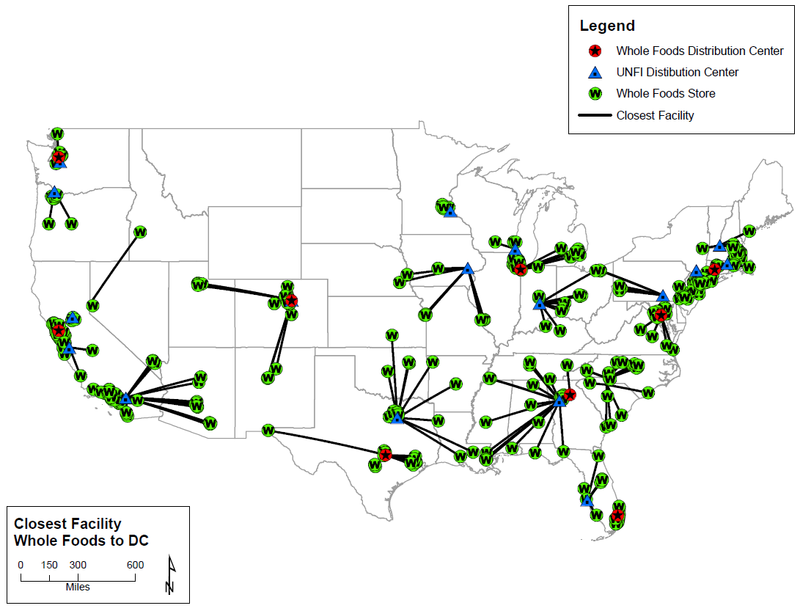 Plotting the locations of the distribution centers readily available through Google Maps against Whole Foods’ stores reveals an average closest distance, from store to DC, of over 204 miles. There are a handful of stores for which that number exceeds 700 miles. The implication of this is straightforward: Whole Foods does not have a complete logistics network, much less one that can efficiently move around billions of dollars worth of perishable products, over hundreds of stores, for tens of millions of customers. Whole Foods thus heavily relies on two partner entities: United Natural Foods to get products into its stores and Instacart to get them out. 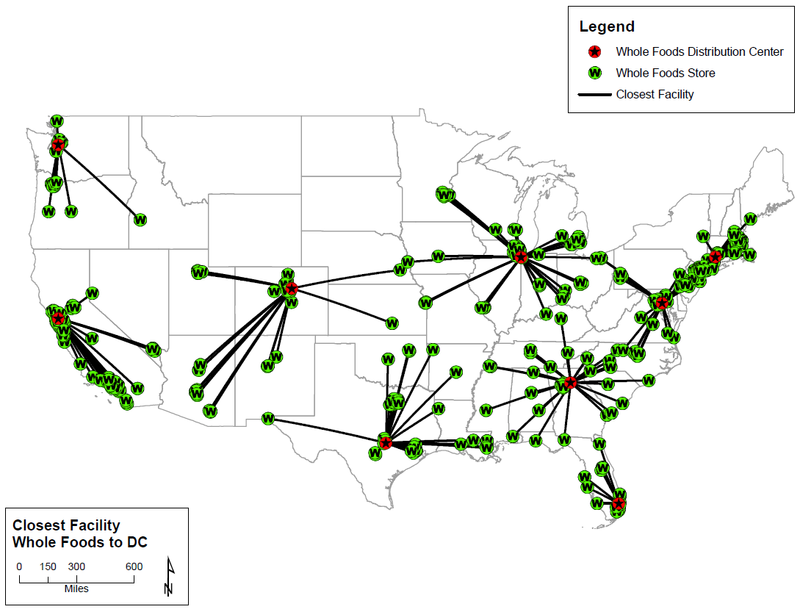 When we include UNFI DCs in our distribution network model, the average distance from a store to the nearest DC is cut in half to just over 100 miles. The above is just a model, but it tells a clear story of Whole Foods’ distribution reliance. But if we replace UNFI DCs with Amazon FCs in the model, the average distance from the store to the closest FC/DC drops even further to 88 miles. This is not to say Amazon would do such a thing. The last thing the company wants is to run an archaic store-centric supply chain for a grocer. Also, unlike Amazon, UNFI has a distribution network purpose-built for perishables. In many ways, it has built this network for Whole Foods with whom it has a contract through 2025 and an 18-year relationship. UNFI derives 35% of its net revenue from Whole Foods, which is by far its largest account. As of this writing, UNFI’s stock price had tumbled nearly 13% since the acquisition announcement. True, the relationship still makes tons of sense, but it’s also the case that Whole Foods no longer needs UNFI as much as before. Something similar could be said of Instacart, whose contract with Whole Foods expires much sooner. In the long run, a distribution network that pushes produce through UNFI, then Whole Foods, then Instacart before it gets to the consumer will not do for Amazon. There is a ton of duplicative work and wasted mileage — not to mention that each of these parties gets paid in margin. UNFI takes about 15% in gross margin, Whole Foods takes 34%, Instacart is apparently gross margin positive, and the customer pays all of the above. In 2016, something interesting happened to grocery prices. For the first time in 50 years, at-home food prices fell. And this trend appears to be persisting through 2017. Some of this obviously has to do with macro factors beyond retailers’ control, but price competition among major grocers is undoubtedly getting fierce. This might worsen as European discount grocers Lidl and Aldi aggressively enter the U.S. market. Even in the natural and organic foods segment, lower-priced alternatives like Trader Joe’s are sucking customers away from Whole Foods. But if there’s one thing Amazon knows how to do it’s to take cost out of the supply chain and compete on price. That is precisely what we should expect the company to do. Amazon will leverage its newly acquired urban real estate assets, its logistic network, and last-mile fulfillment capabilities to build a truly customer-centric grocery distribution network. UNFI moves goods from its DC to a Whole Foods store. Instacart picks produce from the store and brings it to your house. And neither has any meaningful control over the final price. Amazon can now deliver from anywhere to anywhere. All while lowering the price the consumer pays through passing on newly-created cost savings, offering incentives for Prime members, expanding Whole Foods private brands, or just by trimming Whole Foods’ infamous markups. Whether in the store, or at their doorstep, Amazon can devise the most convenient and efficient route for customers to receive their groceries. This is the price-competitive omnichannel model that Amazon will use to dominate the grocery market. But why stop at groceries? Now within 20 miles of most of the U.S. population, Amazon can gradually expand same-day and same-hour delivery. One of the reasons why over 90% of retail spending remains offline is because so many product needs are immediate: I need a coffee now because I’m tired, I need an Advil now because my head hurts, I need a sandwich now because I’m hungry. Two-day or next-day delivery just won’t cut it, no matter the discount. This is perhaps why so many venture dollars have been flowing to last-mile businesses like Uber, Lyft, Postmates, and Instacart. Getting the economics of the last mile to work with density radically expands the boundaries of online commerce. Amazon now has everything it needs to build that local scale. It might start with groceries, but it will iterate with everything else. What will happen to Whole Foods stores? Will they become humdrum fulfillment nodes in Amazon’s logistics machine? I suspect the exact opposite. If Amazon has been paying attention, it has certainly noticed the direction in which the natural and organic grocery market is headed. The future of the category looks a lot like Trader Joe’s or Sprouts Farmers Market: smaller format stores with competitive prices and unique product selections. Amazon doesn’t want to turn Whole Foods into Kroger or Walmart. If customers want boring grocery items, they can have them delivered same-day to their home through AmazonFresh or Pantry for a great price. On the other hand, if they want to go on a treasure hunt for artisanal jars of Napa Cabbage Kimchi and lament the dominance of Monsanto, Whole Foods will be a short drive away. Perhaps that means building revved-up versions of Whole Foods 365 or maybe something even more ambitious. In fact, Amazon may be wise to leave that part for the Austin grocers to figure out. Meanwhile, the company can start doing on what it does best: building the winning logistics backend for groceries and, ultimately, everything.